Conny's Corner: Samba on the street! Being a hippie at heart, my favourite way to travel is on roadtrips. And the iconic method of transport that comes to mind is a 1962 Volkswagen T1 Samba. I don't know what it is about this car, but I really want to own one some day. They're so spacious that you could move house in one of these mini vans. 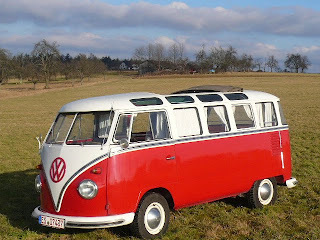 Or, you could do what I'm planning to do once I've got one, and get the back all comfy and equipped for roadtrips. There's so much space, you could even stretch out and sleep in this car, instead of getting soaked in a tent! This is the car people droved to Woodstock in! I don't think any car defined a generation as much as the Samba (or Caravelle Type 1, as it's called on this island). 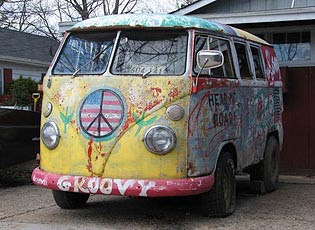 Many replaced the VW emblem with the peace sign during the sixties and painted the car in all kinds of colours. Even today, there's something special about them, don't you think? They're good on all kinds of roads, and with 25 windows, they really do let the sun shine in (did I mention there's a sunroof as well?). I imagine it to be brilliant. Take this car with you wherever you go and you have a home away from home on wheels! Pure roadtrip bliss! Stylish machines, although I'm told the T1s are just...a bit...slow! Still, I'd rather go on a roadtrip in one of these than one of those dreadful gloss white caravans!